Right from the beginning this book has your mind pondering, Lyra receives a letter saying that the cause of death of her Aunt is suspicious. She thinks it could have been magic that killed her since nothing can be found medically. Lyra makes the hard decision to put her career on hold to pursue this mystery as well as take up some magic lessons. Her Bonded Mate Cullen Drake is the only way for Lyra to travel to the magical realm Dragonspier where she will be learning more about her inherited scribe abilities. Once the journey is made Lyra finds out not everyone is happy to see her, a cloaked rider is after her and trying to steal her Aura. Cullen fights to keep her safe but ends up seriously hurt, Lyra decides she needs to learn as much magic as possible so she can take out the cloaked rider, save Cullen and find her Aunt's killer. I received this book for review purposes, I have not read the first book in this series called Seeking a Scribe. I would recommend reading this series in order just because there are some references in this book that happen in the first book and you'll know more about what's going on in book 2. 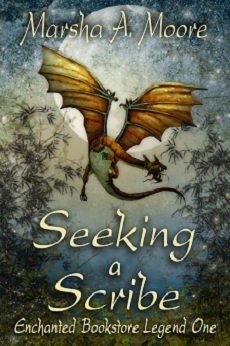 If you love books full of magic, adventure, and Dragons this series is for you! Book 1 in the Enchanted Bookstore Legend can be purchase at AMAZON for only $.99! 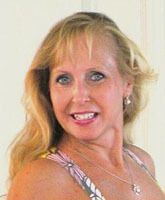 I'm going to give the floor to Marsha Moore, She is providing a special deleted scene for us to enjoy! In this scene, Lyra is practicing a new skill—forming and throwing powerballs. As the new Scribe, she has inherited vast magical power from her ancestors. They were four strong women who each served Dragonspeir by trapping magic in written accounts of key moments in the fantasy world’s history. Lyra is accustomed to excelling at various magic crafts, but cannot master powerballs, no matter how hard she tries. This scene was cut because there were others that served the same purpose. “This weather is fierce. Are you sure?” Cullen asked. Lyra didn’t reply, focused on gathering her inner fire into a tighter sphere. She formed dozens and let them go, not about to bring one into her hand until it showed improvement. The steps made more sense to her after her lesson with the Phoenix, yet her powerballs didn’t show much improvement. Finally, she created a well-condensed one. She took a breath and carefully gave a push of energy, moving it into her palm. It gleamed with steady golden light, a tighter tennis ball size compared to the wobbling soft balls she made before. “Hmpf. I can avoid hurting an enemy—not exactly my intention.” She stalked off toward the cabin, frozen ground crunching under her footsteps. Thanks so much Marsha! 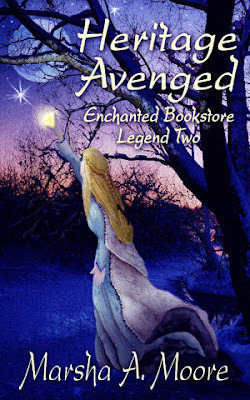 Marsha is generously offering you a chance to win a Digital Copy of Heritage Avenged below! Only mandatory entry is being a After Dark follower all others are extra entries. Winner will be announced on Blog, Facebook,Twitter and email! Anyone can enter, good Luck! I low things magical and mystical, I will be honest I have never heard of Marsha until this competition but I think that's a good thing as I get excited when I find a new author to me. Hi Sheila! I love those things too. That was one of my inspirations for the series--I wanted to have fun with lots of dragon characters. I have all types in these books--wicked and fearsome to sweet and cuddly...and one that seems to be both! Thanks for stopping by, Linda. This sounds like a pretty cool story - something that I'd like to read anyway :) Thanks for sharing this book! Sounds like a great read, i love dragons & magic! I have never read any of her books, but this description sounds great! I love the magical and mystical! Will be adding this to my to-read list!